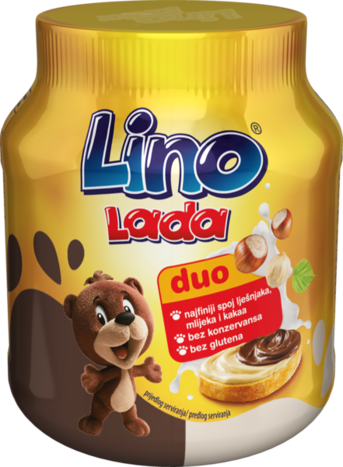 Lino lada duo is so delicious because it is produced from natural ingredients with even 10% of finely selected roasted hazelnuts which are a great source of minerals and vitamins. Cocoa is rich in antioxidants, milk is rich in calcium. This tasty and irresistible combination of hazelnuts and cocoa provides a double pleasure on one slice of bread because brown and white Lino lada are a perfect match. Lino Lada Duo can be eaten as a spread on bread, filling pancakes, ice cream, to prepare the supreme cakes or as a stand alone dessert. sugar, sunflower oil, hazelnuts (10%), whole milk powder (9%), vegetable fat (palm, soy), whey powder, skimmed milk powder (4%), fat-reduced cocoa powder (3%), dextrose, emulsifier: soy lecithin, fully hydrogenated rapeseed fat, flavourings. Storage: Keep in dry place at temperature na 15 –20°C, do not expose to sun light. Shelf life: Package 20 g: 10 months. Other packages: 12 months.